Actually, it’s kind of like the Lego Movie. It’s Friday Five! But on a Saturday! Another Friday! 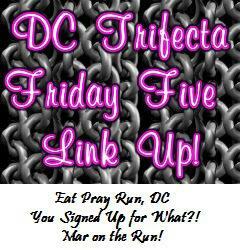 And that means we are linking up for the Friday Five, with three amazing DC area bloggers: Mary at Mar On the Run, Cynthia at You Signed Up For What?! and Courtney from Eat Pray Run, DC. 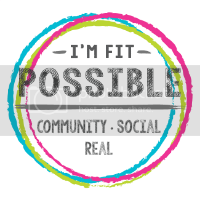 Feel free to join the fun with your own Friday Five post and be sure to visit and comment on the other blogs on the linkup! Our topic for this week is Five Good Things. Even though he’s a Jets fan, I’m darn grateful to have met him all those years ago at the bar at Bru’s. I know I totally get on his nerves (a lot), but we make a pretty good team and there’s no one with whom I would rather be on this journey of life. There are no words for how much I love him. He hung the stars in my sky. I can’t remember my world before him. I absolutely adore animals, especially ones with smushy faces. If we could, I would have an entire ranch of pugs and bullies and boxers and bostons. We are hopeful to add to our family of bagel-tailed cuties sometime this summer. Fingers crossed. We are so fortunate to be surrounded by so much love and support, every day. I know it sounds hokey, but it’s true. I wouldn’t trade our life for anything. It’s not perfect, but it’s ours. Tell me five good things this weekend. 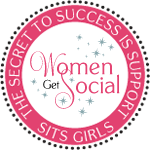 Share in the comments or create your own blog post. 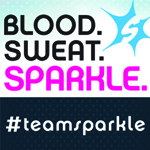 Please sure to join in the linkup! Awww this is the sweetest! I actually like number 5 the most only because how often do we truly step back and appreciate how good things are at the end of the day? I hate to be cheesy, but … I think so many times we do tend to focus on the negatives and what we don’t have. And I’m grateful, every day, for what we do. Such a happy post!!! Love it! Awwwwww so cute…all of your guys! Well I am sure you are having a wonderful weekend with your lovely family!! It’s a great weekend! We got to see so many family members and now we are celebrating Easter itself! Hope your weekend is great! Gotta love your guys! I love mine too…and need the occasional reminder that I need to be grateful for them, even tho they drive me crazy! I love all of them. Have a great weekend! Aw, those are all great things! Hope you are having a great weekend! Being a major family person myself, I love that your good things were all about your family! My sons and daughter-in-law were here for Easter dinner, and I can’t tell you how much fun we have when we all get together! LOL! It all balances out!